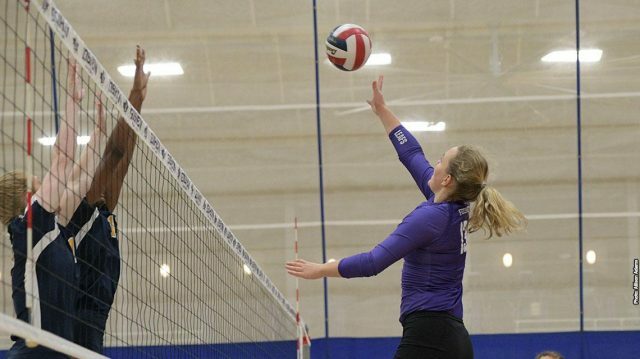 The Maple Leaf women’s volleyball team fell in both their matches this weekend as they lost to Huntington University on Friday 2-3, and 0-3 to Marian University on Saturday. On Friday, neither the Foresters or Maple Leafs took control early as the two teams traded points all the way to 17-all. A kill by first-year Riley Woods however, broke the tie for good. The Foresters of Huntington would bring the game within one at 20-19 but Goshen controlled the game at the net. Senior Sydney Cruz and sophomore Elizabeth Breckbill each tallied a kill and a block to capture the first game of the weekend, 25-20. The second set began much like the first with both teams battling to gain an early edge. A kill by Woods brought the game to a tie at 9-9, but from there on miscues from Goshen led to a 9-2 Forester run. At 12-18, the lead margin was too much to overcome for the Maple Leafs as they would drop the second set, 15-25. In an important game three, both teams looked to play their best volleyball of the night. A kill by sophomore Taylor Eash put the Leafs up 7-4, which would be the largest lead for either team in the entire third set. The Foresters would respond as they tied the game back up at 9-9 and would eventually take their largest lead of the game at 14-16. 12 ties and six lead changes brought out the best in both teams as they combined for only eight errors, the lowest total of all five sets. At 18-20, Goshen put together a run of their own as they earned three straight points off of consecutive kills by Woods and Breckbill, to take a lead at 21-20. The teams would then trade points until 22 all as the Foresters put together a decisive run in order to capture the third set 23-25. In a must-win fourth set, the Leafs started off slow as they were not able to reach Huntington until a kill from Cruz tied the game up at 11 a piece. The Foresters, however, didn’t flinch, as they strung together three straight points to extend their lead to a comfortable distance. A resilient Maple Leaf team would not go away as they battled back to tie the game up at 19 and then capture their first lead of the set at 20-19 off a kill from Eash. Back-to-back aces from senior Meghan Manley stretched their lead for good as the Leafs forced a fifth set by a score of 25-20. In the decisive fifth set, Goshen got out to a strong start as they scored the first three points of the game. The response from the Foresters would tie the game up at six a piece which would remain a trend for the rest of the game as the two teams went back-and-forth, tying the game up six more times. At 13 all, the Foresters would take the final two points and take the hard-fought match by a score of 13-15. Eash and Breckbill paced the Maple Leaf attack with 11 and 10 kills respectively. First-year Naomi Willis led the team with 29 assists and three aces. The following day, the Leafs would travel to Marian University to take on the 20-4 Knights. The Knights started the day off strong as they went on a 10-4 run to take an early first set lead. Goshen strung together a few kills from Cruz and senior Hallie Vanitvelt, but the balanced attack from Marian was too much to overcome as they took the first set, 11-25. The second was much of the same as the Knights were able to get out to the same 4-10 lead, and wouldn’t look back. Six straight points stretched the lead to 6-17. Back-to-back aces from senior MacKinnon Tracy headlined a late run by the Maple Leafs, but the Knights proved too strong once again as they took a two-set lead by a score of 15-25. In the third and final set, Marian took control early once again and rolled to a 14-25 victory and sweep at home. Vanitvelt and Breckbill lead the Goshen attack with six kills each. Sophomore Jennifer Ritchie led the defense with eight digs; Tracy added six and two aces. After a full weekend of travel, the Maple Leafs drop to 8-16 on the season and 2-10 in the conference. Goshen will play their fourth straight road game on Wednesday, Oct. 10 as they travel to Fort Wayne to take on Indiana Wesleyan at 7 p.m.